Too easy to score against? Where are the goals going to come from? What did we learn from Albion's defeat at Leicester? Conceding inside a minute was a nightmare start for Albion and from then on they did not look like getting back into the game. All the time it was 1-0, there was hope but Leicester's second early in the second half put the result beyond doubt. Brighton manager Chris Hughton admitted afterwards that Albion were not at the level needed for the Premier League and midfielder Dale Stephens said the Seagulls have to improve. Albion will hope a midweek League Cup tie against Barnet will bring some much-needed confidence. Albion won't win too many games in the Premier League with the goals they're conceding at the moment. While they produced a resolute defensive performance against Manchester City last weekend, the visitors still punished Brighton for two mistakes. It was much the same today. Markus Suttner was beaten too easily down the left by Riyad Mahrez and when the Leicester winger's shot was only parried by Mathew Ryan, Shinji Okazaki was on hand to turn the ball home after just 52 seconds. The hosts' second will also be disappointing from a Brighton point of view as Harry Maguire headed home Mahrez's corner from close range. At the other end, Albion didn't offer enough of an attacking threat and rarely tested Leicester keeper Kasper Schmeichel. The worry Albion fans had before the season started was whether the team would score enough goals. After rarely threatening against Manchester City last Saturday, Albion had more attacking possession today but again didn't look like scoring. Jamie Murphy had one powerful strike blocked in the first half, while Kasper Schmeichel only had long-range strikes from Tomer Hemed and Solly March to save. Anthony Knockaert is returning to full fitness and will be a big player for the Seagulls this season, as will new signing Jose Izquierdo, who will inject some much-needed pace into the side going forward. A worrying sight was Glenn Murray limping off midway through the second half. With Sam Baldock already out with a calf problem, it could leave Tomer Hemed as the only fit striker. Rumours this morning linked Albion with a move for Cardiff striker Kenneth Zohore - Brighton certainly need some more firepower to give themselves the best possible chance of staying in the Premier League. It's important for Albion fans to not get too downcast. While they have yet to score or get a point, they have come up against two strong sides. Manchester City will be there or thereabouts come the end of the season, while Leicester showed some of the form which saw them crowned Premier League champions in 2015-16. Yes, Albion gave the ball away too easily at times but they were against a side who will most likely be around the top ten come the end of the season. Riyard Mahrez was excellent on the right wing for the hosts and set up both Leicester goals. Home journalists said it was the best he had played for more than a year - since he was crowned the PFA player of the year when the Foxes won the title. The movement of Shinji Okazaki also caused Albion problems, while Wilfred Ndidi impressed in midfield and new signing Harry Maguire, a £17m purchase from Hull in the summer, looks an excellent addition in central defence. Brighton had four of their summer signings in the starting line-up today and it's fair to say they'll have better days for the club. Goalkeeper Mathew Ryan has received stick on social media for parrying Riyad Mahrez's early shot to Shinji Okazaki, who tapped Leicester into an early lead. Ryan has also received criticism from some fans for goals he conceded in Albion's pre-season friendly to Atletico Madrid and last week's match with Manchester City. BBC Sussex summariser Warren Aspinall said today he feels Albion need another goalkeeper because Ryan does not bring much confidence. 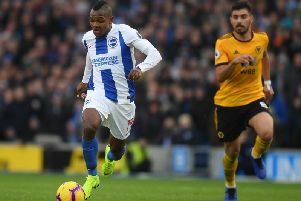 Left-back Markus Suttner was beaten too easily by Mahrez for the opening goal and attacking midfielder Pascal Gross struggled to get into the game and was substituted just past the hour. There were signs central midfielder Davy Propper, who joined just days before the start of the season, is growing into his role in the team but Albion need to look after the ball a lot better in upcoming games. Albion's talismanic winger Anthony Knockaert received a excellent reception from the Leicester fans on his return to the club. The 25-year-old spent three years with Leicester earlier in his career, helping them win the Championship title in 2013/14. Knockaert was applauded by the Leicester fans when he warmed up in the first half and received a standing ovation from the home fans when he came on just past the hour with Albion 2-0 down. He came on just past the hour but was unable to help the Seagulls get back into the game. It wouldn't be a surprise to see him start at Watford next week after an injury interupted pre-season. Former Albion striker Leonardo Ulloa, on the bench for Leicester, received a warm reception from the Seagulls fans when his name was read out before the game.